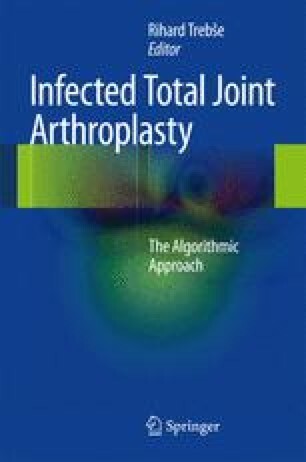 The prevalence of orthopedic implant-related (deep) infections is approximately 0.5–1.5 %. They are divided to early (<1 months after the implantation) and delayed (1 months–2 years after the implantation) infections, which are somewhat overlapping with late infections (over 1–2 years after the implantation). Early and delayed infections are usually caused by direct contamination during the operation by more or less virulent microbes in patients with lowered local and/or systemic bacterial resistance, but late infections are usually hematogenous. Microbes in the body are usually fought back in healthy living tissues, but implantation-associated hemorrhage and the abiotic implants form an unprotected surface, locus minoris resistentiae. Here, planktonic bacteria easily adhere and soon form a protective extracellular polymeric substance (EPS, biofilm, “bacterial slime”) and transform to dormant but intercommunicating and even polymicrobial colonies. Embedded in the biofilm, antibiotics cannot by diffusion reach high enough (therapeutic concentrations), and suboptimal concentrations only select for resistant strains. Leukocytes, antibodies, and complement have poor access to biofilms. Further, using quorum sensing, biofilm bacteria behave very intelligently, adjusting the colonies to various threats to their existence, by adjusting the bacterial population to a size which realistically can survive, by developing antibiotic resistance and exchanging resistance between themselves, and by developing organized structures so that the microbes at every layer and depth have adjusted to their local micromilieu, e.g., oxygen tension, nutrients, EPS composition, antibiotics, and antifungals. If the in vivo “culture conditions” are favorable for the microbes, e.g., due to developing immunosuppression of the host, colonies can activate and start to send metastatic satellites to invade adjacent and remote new sites (foci). Removal of the infected implant is often the only effective therapy but happens at the cost of the implant, with antibiotics only playing an adjunct role. Diagnosis can be verified by detaching biofilm hidden bacteria by ultrasonication from the retrieved implant contained in fluid in a plastic bag and by combining routine microbial diagnosis, such as culture and staining, with more modern polymerase chain reaction analysis of the microbial DNA. The race between evolutionary antimicrobial resistance development and the drug companies developing new antibiotics seems to be tipping in favor of microbes. Therefore, intelligent use of systemic and local antibiotic prophylaxis, disinfection, aseptic techniques, testing of eventual carriers of resistant but asymptomatic strains, and separating carriers from clean but infection-prone patients are important principles. The development of implants and implant coatings able to resist bacterial adhesion and colonization is important, and new antimicrobial drugs working using new modes of action, e.g., based on the use of bacteriophages, should get more scientific attention. Nessar R, Reyrat JM, Davidson LB, Byrd TF. Deletion of the mmpL4b gene in the Mycobacterium abscessus glycopeptidolipid biosynthetic pathway results in loss of surface colonization capability, but enhanced ability to replicate in human macrophages and stimulate their innate immune response. Microbiology. 2011. doi: 10.1099/mic.0.046557-0. PII:mic.0.046557-0.